ATLANTA (AP) -- With a damning secret recording of his opponent and a late Trump-Pence endorsement, Secretary of State Brian Kemp on Tuesday won a bruising Republican runoff in the race for Georgia governor. A self-described "unapologetic conservative" whose campaign ran an eyebrow-raising ad that said he could use his own pickup truck to "round up criminal illegals," Kemp rode a national wave of voter contempt for the establishment in favor of bare-knuckled outsider politics. He now faces Democrat Stacey Abrams, who could become the country's first black female governor, in a race that will test Democrats' assertion that changing demographics have turned the Republican stronghold into a swing state. Kemp thanked supporters at a party in his hometown of Athens, Georgia, on Tuesday night and said he had won a "clear, convincing victory." He credited the White House's backing for sealing his win. 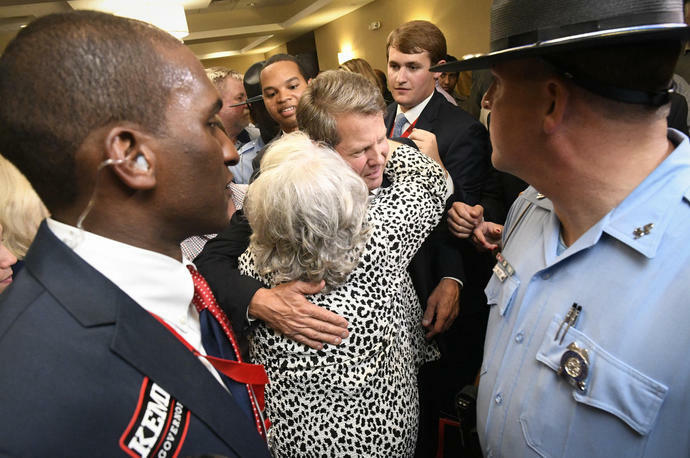 "They poured gasoline in the fire and fueled the Kemp surge to victory," Kemp said. In a tweeted endorsement last week, President Donald Trump pointed to Kemp's tough stance on illegal immigration and strong support for gun rights. With days left in the race, Vice President Mike Pence also stumped for Kemp on the campaign trail. Both reiterated their support for Kemp in tweets Tuesday. Kemp's victory is likely to embolden Trump to become even more engaged in shaping the Republican Party in the final months of the primary season. And it is another election success for a Trump-approved candidate, following victories by Katie Arrington in South Carolina and Martha Roby in Alabama. "We have to rally behind him, so he can before the next governor of the state of Georgia," Cagle said of Kemp. "He is a person who is undeniably ready to lead this state. We have to rally behind him." But Keenan Rogers, a 25-year-old Cagle supporter, was not yet convinced. He said he is leaning toward voting for Abrams over Kemp, but hasn't come to a decision yet. "My knee-jerk reaction is to vote for Stacey Abrams," Rogers said, but added that he wanted to do more research on both candidates. "She might be a step forward for millennials ... But right now, I'm a little apprehensive." Kemp had received widespread criticism - and national headlines - with television ads in which he pretends to intimidate a young man interested in his daughter with a shotgun and says he has a big pickup truck "just in case I need to round up criminal illegals and take 'em home myself." Cagle labeled Kemp "inKempetent," pointing to a 2015 incident in which Kemp's office inadvertently released Social Security numbers and other identifying information of millions of Georgia voters on disks sent to members of the media and political parties. Kemp spokeswoman Candice Broce laid the blame squarely on Kennesaw State University, which had a contract to manage the system. "It was not our system. It was not our equipment. It was not our network," Broce said.